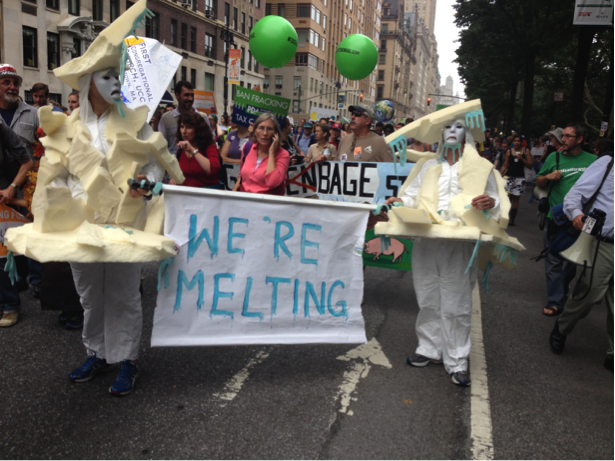 What was the People’s Climate March? 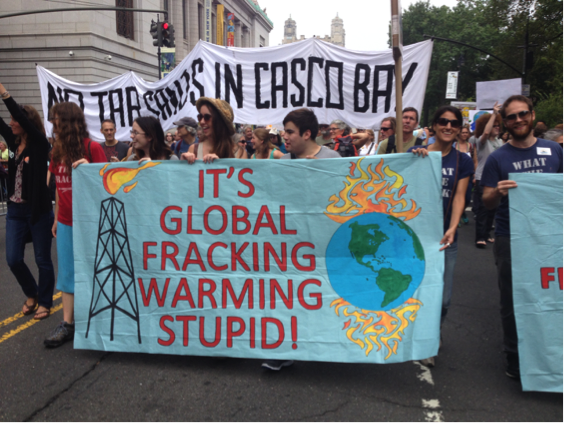 On Sunday, September 21st, the People’s Climate March (PCM) was held in the streets of New York City. It has since been estimated that up to 400,000 people attended the event, including U.N. Secretary-General Ban Ki-moon, former Vice President Al Gore, Bill McKibben, Jane Goodell, and Leonardo DiCaprio. 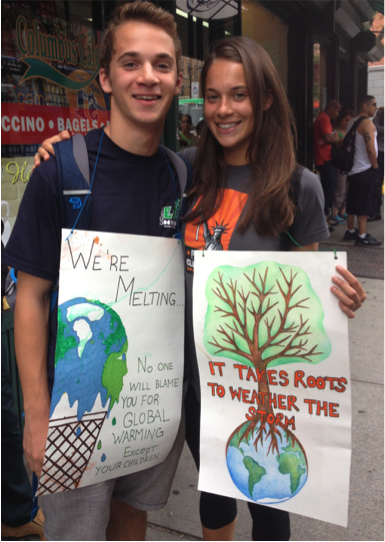 The mission of this march was to form a united front in support of reducing greenhouse gases. Approximately 80 UConn students participated in the march. 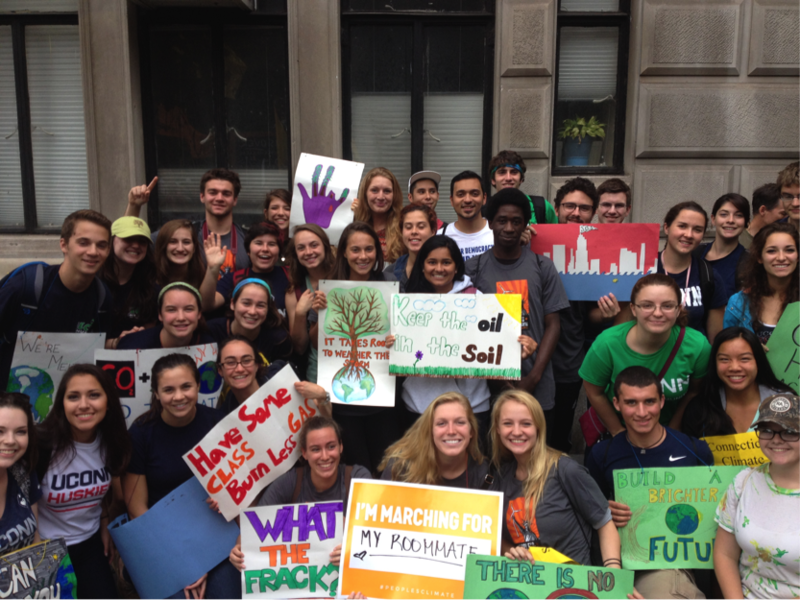 While there were a handful of Environmental Science majors and EcoHusky and EcoHouse members, there were also Business students interested in the economic implications of climate change and Political Science majors invested in the human rights aspect of the march. In fact, the diversity of studies included Animal Science, Psychology, Biology, Marketing, Finance, ACES, Natural Resources, Environmental Engineering, and more. Additionally, a bus of around 50 members from the Mansfield community joined the UConn students at the march. Why was this march so significant? Government action is stagnant. Climate change, however, is hurdling forward with an intense ferocity. Even the most conservative predictions of how our planet will be affected are deeply troubling. The three pillars of sustainability require that we find a balance between economics, society, and the environment but the heat of politics has made this difficult to achieve. We need to hold the government accountable for the lack of climate policy. Resolving this issue is vital to our survival. Thus, we as citizens need to put pressure on our government to develop international emission reduction commitments and PCM provided an audible platform for us, the people of UConn, the people of the United States, and the people of the world, to do so. Why is it important that UConn students participated? Education is the key to environmental progress. The academic setting of our country’s universities is where we need to introduce the concept of green living to the young minds of America and inspire our students to take action. Students are our future. They will become the policymakers, lawyers, activists, engineers, consultants, professors, and researchers that we need to build a sustainable planet. UConn is at the forefront of sustainability and our participation in the march both reflects our environmental goals for our university as well as for our planet. My name is Emily McInerney and I am a senior at UConn majoring in Natural Resources. I have always cared deeply for the environment but this was my first opportunity to participate in an environmental activism event. To be surrounded by such a large group of individuals who share the same passion for environmentalism was an exceptionally rewarding experience. The thousands of creative displays and signs were outstandingly impressive. While the march was a call for urgent action, it was conducted peacefully, with lively music and dancers filling the street with the optimism of a green, clean energy future. The defining moment of the event was at 12:58pm when there was a moment of silence. New York City is never quiet but for two brief minutes all that could be heard were distant cars and the steady breathing of the marchers as they joined their hands together. This was followed by a long string of howls and cheering. Witnessing these four minutes alone was enough to give someone the shivers and it made me proud to be involved in such a monumental moment in history. The UN Climate Summit convened on September 23rd and this march helped spark discussion about supporting renewable energies and transitioning away from fossil fuels. Ultimately, we need to implement international laws to support the reduction of greenhouse gases. Whether this will happen only time will tell. Regardless, our voices were heard. Our presence was not only felt on the streets of New York but also throughout the globe, through social media, the news, and the various other climate activism events that took place in other parts of the world in conjunction with PCM. The fight however, is not over. Hopefully the people of our planet will continue to strive for sustainability. UConn and its many environmentally devoted students certainly will. 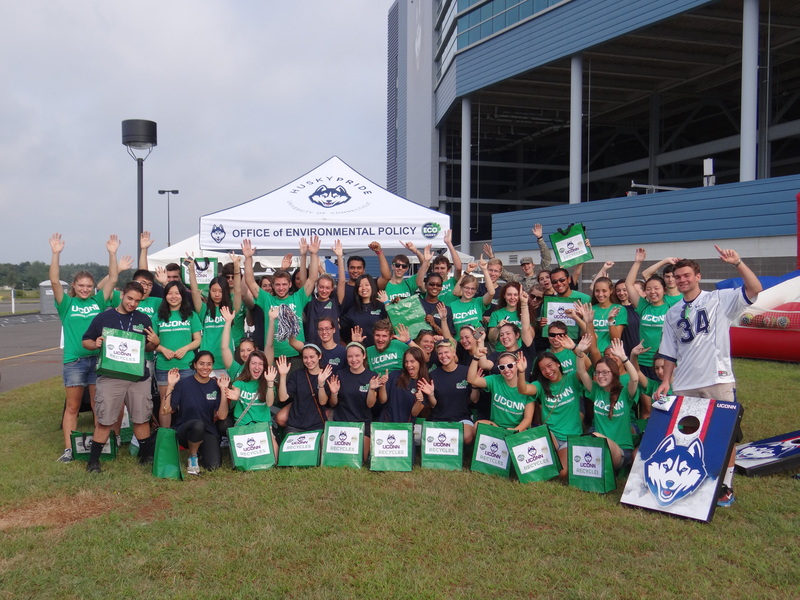 This past Saturday, September 7th, almost 50 volunteers from EcoHouse learning community, the EcoHusky student organization, the UConn Honors Program, Phi Sigma Pi National Honor Fraternity and the UNIV 1784 Environmental Sustainability class teamed up to promote recycling at the Green Game Day for UConn Football versus Stony Brook. 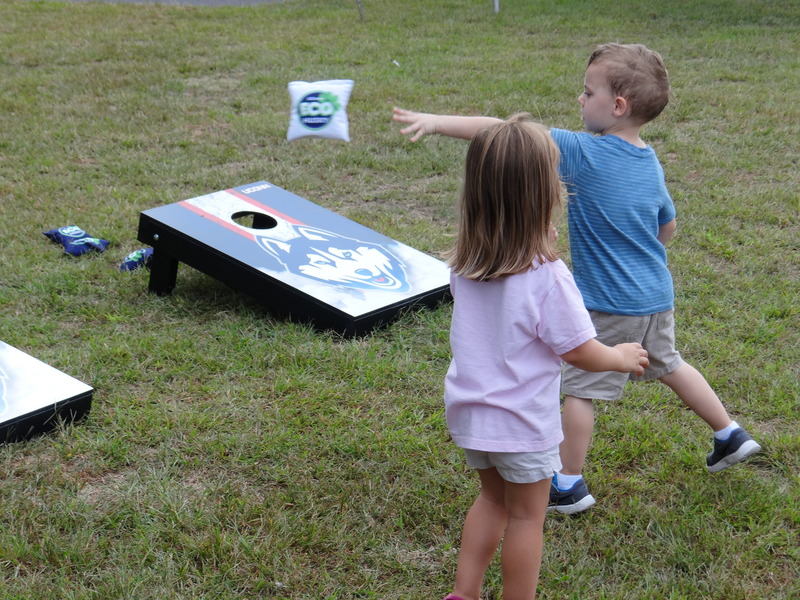 Everyone who came to the game enjoyed seeing a closely contested 19-16 UConn victory. 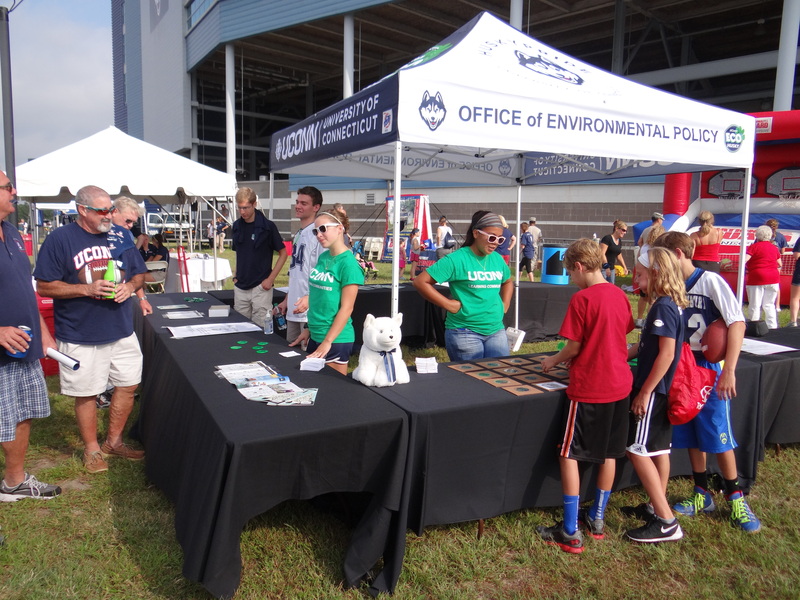 The Office of Environmental Policy (OEP) set up a brand new tent, along with several games and give-aways at the Football Fan-fest outside of the stadium. Streams of UConn students, alumni, and families came by the tent to learn about Green Game Day recycling and initiatives the university is taking to improve its environmental footprint. 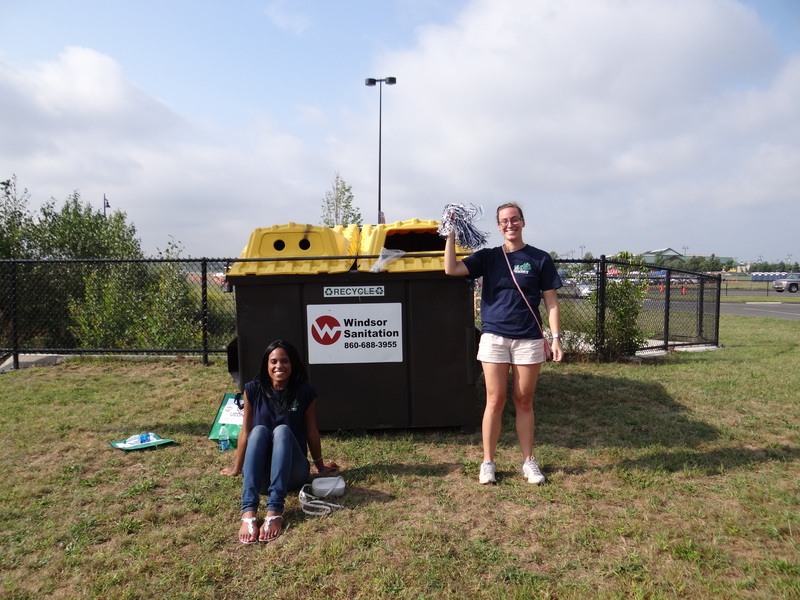 Volunteers wearing blue and green EcoHusky and EcoHouse T-shirts teamed up in groups to pick up recyclables at each of the tailgating lots (Red, blue, grey). Tailgaters were very appreciative of the efforts and were open to discussing UConn sustainability initiatives. Overall, the event was very successful – volunteers filled the dumpsters with recyclables and fans were eager to participate! Green Game Day serves as an interactive learning opportunity for the wider community about everything that UConn does to be more environmentally conscience. It also gets student volunteers involved and sparks their interest in pursuing more environmental efforts. There will be more Green Game Days to come this year – one for each of our National Champion Men’s and Women’s basketball teams! The best thing about little kids is that their dreams have no limitations. Back when I was about eight years old all of my friends dreamt of being the next big pop star, the likes of Britney or the Spice Girls. The vast majority of those same friends have now abandoned the thought of singing to any audience outside of their shower heads. My big childhood dream was a little different, though. My dream was to save the world, singlehandedly, through medicine. I know now that no individual can save the planet without help from others and, more importantly, that even very basic medical procedures make me queasy. I still have not given up my dreams of changing the world, however. I am now studying environmental engineering and hope that in doing so I can make a difference, even if only in some small way. 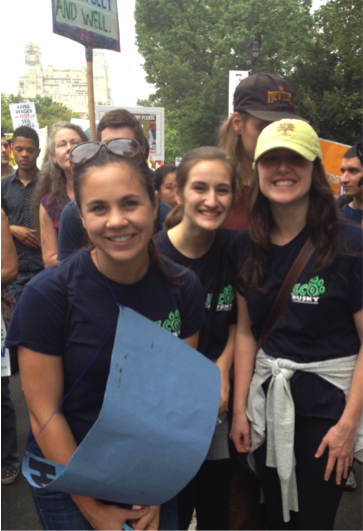 My passion for environmental issues has led me to two different internships as well as to a number of different clubs and activities at UConn and through all of these means I learned about the People’s Climate March. The People’s Climate March will take place on September 21st, mere days before the UN Climate Summit is held in New York City. UN Secretary General Ban Ki-moon is encouraging the participating governments to unite and support global goals for reducing greenhouse gas emissions. Tens of thousands of people are anticipated to march in the streets of New York City in the largest environmental march in history to demonstrate that we, the people, are demanding a change. This march will offer me the chance to show the UN and our country that both climate change and socioeconomic equality matter to me. This march will offer me the opportunity to change the course of history, one step at a time. This march will offer me the possibility to realize my dreams. That’s why the People’s Climate March is so important to me. Please join me and the UConn community in standing up for what is right; an economy that works for both the people and the environment. Join the tens of thousands of people that will be in the streets of New York, proving to our governments that we deserve a safe, just world to live in. Join the People’s Climate March on September 21st for the price of just one bus ticket. 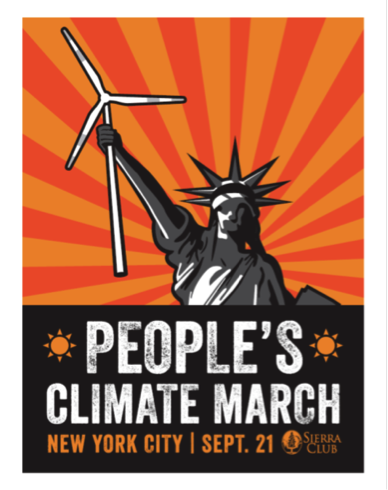 If you would like to RSVP to the People’s Climate March and purchase a bus ticket from Sierra Club for $24.20 as a student or $29.48 as an adult, follow this link. For more information about this event, contact Brianna or Emily at brianna.church@uconn.edu, emily.mcinerney@uconn.edu, or at (860)486-5773.